the 5 o'clock news says 102 degrees. by 6 o'clock it says 103.
and we have dropped to 99.
we drove straight into it. I felt similar to this today, too! So hot up here in Wood County. The wind felt like it was blasting out of my preheated oven! Man oh man, that's hot! It's in the 70's where I am in Maine tonight, but your post brings me back to the 6 years I spent living in Indiana with no AC!!! I remember many a summer's night in the high 90's, just giving in to the heat and having crazy, restless dreams. Heat is good for the imagination. I never learned to love it, but I did respect its power! Yeah that's some kind of hot. Enjoy the shade! Steph - We were south of Frankston and the wind was up and it did indeed feel like an oven. Just plain h.o.t. Gigi - I've loved here with no a/c and it is not fun. but you do it. :) and my dreams have lately been crazy & detailed - maybe the sleeping in a/c doesn't offset the outside time. wow. that is hot. i don't think i've ever experienced anything above 99. I so agree about the shade. Lovely photo! Hope you're well. 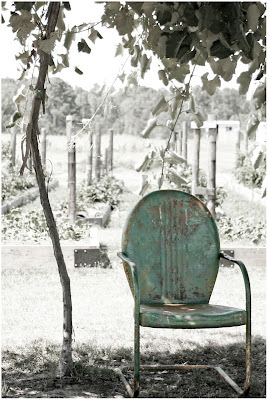 I LOVE that shot, but I also LOVE those vintage metal chairs. I have one too that I keep in my little courtyard. Too hot to use in the sun...we are at similar temps in Las Vegas too. Oh my gosh...what you do with words. You bring all the senses alive with your words. It's as though I can feel the heat from here. Great post. No that heat would not be for me. Love the photo. And heat like that does create a mirage. I hope the drive gave you a respite from the heat. 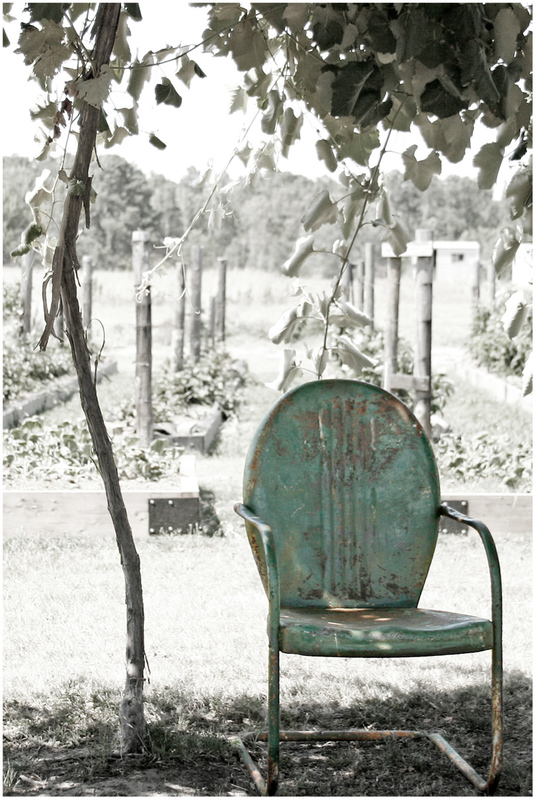 I dream of a collection of those chairs all sitting on my patio and fading in the sun.